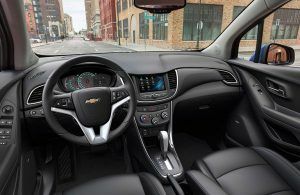 Home > News & Events > News > What’s Inside the Chevy Trax? What’s Inside the Chevy Trax? The 2017 Chevy Trax is sporty and responsive. The sleek design and athletic stance make the Trax fun to drive, and will have you feeling comfortable and confident behind the wheel. Let’s take a closer look at the interior features of the 2017 Trax! The interior of the Trax features refined fabrics, accent stitching and available leatherette seats to add a layer of luxury to the vehicle. The Trax has a dual-cockpit cabin design, making it easier for both the driver and front passenger to be comfortable and connected. The driver’s instrument panel is updated and includes chrome accents to give the cabin more flair and style. The 2017 Trax has up to eight seating configurations that allow you to fit any combination of cargo and passengers. The Trax can seat up to five passengers, and still has 18.7 ft3 of cargo space. You can fit items up to 8 feet long in the Trax with the passenger-side seats folded down, and incredible cargo versatility allows the Trax to fit in with any lifestyle, reaching a maximum cargo volume of 48.4 ft3. The Trax is loaded with plenty of technology to keep everyone connected and entertained. Check out these available technology features on the Trax! The 2017 Chevy Trax is available now at Lanoue Chevy. You can browse our inventory and set up a test drive online before coming in to see us at the dealership!